Christmas time is over and we can slowly start to get ready for the next big thing ( and for most of the people it is not a big deal at all) and I'm talking about Valentines Day. I know that not a lot people plan something very special for Valentine's day, but I remember my first Valentines Day with my boyfriend. It was really nice and we only went away from the Riga to a smaller Latvia's city, had nice dinner at the restaurant and like that. See, also a simple little trip can make you both happy. But I'm not saying that you only can go on a vacation on Valentine's day. Go now!! And I will list you 5 amazing ideas for your next trip together. Enjoy. 1. Cruise - Whenever it is a 2 week Mediterranean cruise or 3-day cruise to Stockholm, I think that this is a great idea for a couple. Even better I think it is for new couple's that don't know each other so good yet. On a cruise, you spend all the time together and it is pretty hard to get away from each other haha. Also, there you basically don't have to worry about anything, you can just simply relax in a bar, restaurant or spa. This trip could be for those who just suddenly understand that need to get away, tickets for a small cruise is not expensive at all. 2.Tropical Countries - If you are planning a vacation for a long time and you have made savings, then try something from the tropical countries like Cuba, Thailand and something like that. And with these, I don't mean laying next to clear blue water drinking Pina Colada's ( but of course plan a day like that too) but more I mean that walking in the jungle, doing crazy adventures, eat pastry and crazy things like that. Doing crazy things together will make you both more cohesive. 4. A country with a culture - This may confuse you a bit but let me explain what I meant. Try going to a country with a culture to admire. For example like China, Japan, India ..... Eat all the traditional food, do something they are used to do. This one means a lot of planning and researching. Like you have to check out if there's any holiday that only they celebrate. Believe me, going to the county when they have a national holiday is the best experience ever. 5. The most romantic city in the world - You definitely though I will write Paris right? Well....what I have understood is that everyone thinks differently, I guess every couple has a different most romantic city. Honestly, I would love to visit Paris...but I also think that Verona is a very romantic city. So I guess you just have to visit the city you both really love and it also probably will be the romantic city for you. I hope you enjoyed my post. These are the ideas that me and my boyfriend have planned for the future. So I thought maybe you will also find it useful. Love this post! I've always wanted to go on a cruise & visit Paris. Both are on the "Bucket List"! 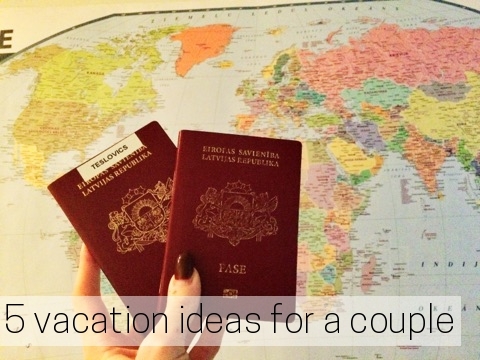 Thank you for sharing these great ideas for a couple's getaway! These are all lovely ideas! I’m planning to go on a cruise next year and I’d love to visit a country with a rich culture that’s very different to ours! 😍 thanks for sharing! I love this and these are all things my husband and I want to do. It just like where do you start? I love this post, great ideas! Having kids for most of our relationship my husband and I have never taken a long trip together but I want to one day! It's a bit odd but Scotland is definitely my romantic place.